I got through the fundraisers, tournaments and events... plus a picnic or two. Now is the time of the school year for award ceremonies: Athletic Awards Ceremony, Academic Awards Ceremony, Music, Art and Technology Gallery...etc. Plus my daughter has a few more softball games before the season ends. Yes, we need rain, but please just two more days of sunshine... so we can wrap this season up! Needless to say my kid's end of school year schedule is not allowing for much reflection, or maybe I really am in denial about French Fridays with Dorie coming to a close? I've stolen an hour today to look back and choose my favorite recipes from "Around my French Table." Hands down Marie-Helene's Apple Cake is my favorite recipe. You all know that I hate to bake, but this is easy to make, and everyone loves it. I think it's the rum or maybe it's the perfect balance between cake and apples... no, it's probably the rum! The Fresh Tuna Mozzarella and Basil Pizza is also an fairly easy appetizer to make, and not expensive either, since I use canned tuna not fresh to make it. I have impressed many a guest with this colorful and complex blend of flavors. I love the punch from the radishes, the softness of the mozzarella, and the saltiness of the olives along with the unexpected note of ginger. 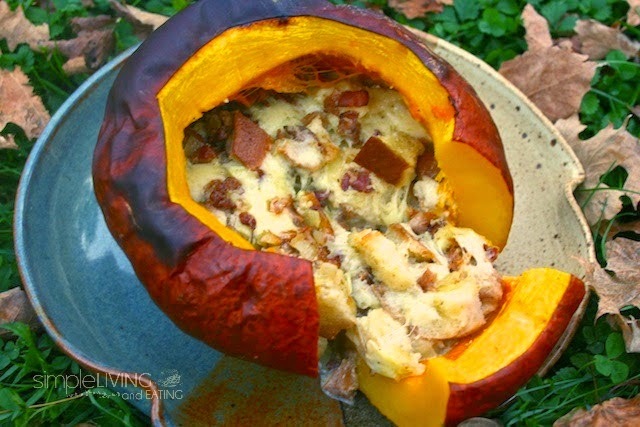 The Pumpkin Stuffed with Everything Good causes quite a stir when put on the table because no one expects to see a whole stuffed pumpkin. It does ooze with everything good, and it is so nice to have a savory recipe to use with pumpkins in the Fall. It is blueberry season right now and my daughter has yet to have time to make the Blueberry Mascarpone Roulade. This dessert is a little bit of work, but it is to me the best Springtime dessert... eat your heart out Strawberry Shortcake! Blueberries are my favorite fruit and this roll up is light, delicate and shows off their terrific flavor without being overly sweet. 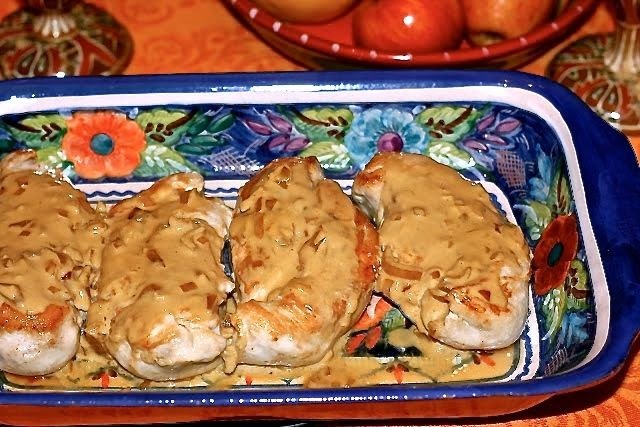 The last of my top five French Friday recipes is Chicken Breast Diable. It is simple to make, the flavors are intense, and it is covered in such a creamy sauce the chicken doesn't dry out, so it is practical to make for a party. Have to dash... not even sure where I am off to right now, but I know I need to load my car with a bunch of fencing equipment....at least all this running around is keeping me in shape! It was so hard to narrow things now. I expecting the apple cake to come up a lot. It was a real pleasure to steal a few moments to look back on many great years of cooking. To me it's hard to forget any of these wonderful recipes... truly, truly a great collection. I predict that Marie-Helene's Apple Cake is going to be on many a list today. It would certainly be on mine as I have made it so many times. So many WAYS. Same with the chicken diablo. Its the number one request of my in-laws for the nights I have them over. I'm nearly tired of cooking it. Oh my tired of Chicken Diable... never. I remember you telling me that you can make the apple cake from memory, now that's impressive. Now I want Chicken Diablo. That was SO GOOD. I love checking out everyone's lists! I need to make chicken diable soon too. Oh the apple cake, it's not on my list today only because it's on another list appearing in a few weeks. Since making it the first time (which was actually before I even joined FFwD) it has become a Thanksgiving staple, having replaced the more traditional apple pie. Good luck with all the running around and hopefully things settle down for you soon. I would love to have the apple cake replace the apple pie at Thanksgiving because I prefer cake over pie, but the rest of my family is not in agreement. Even the rum won't convince them. I loved your list! 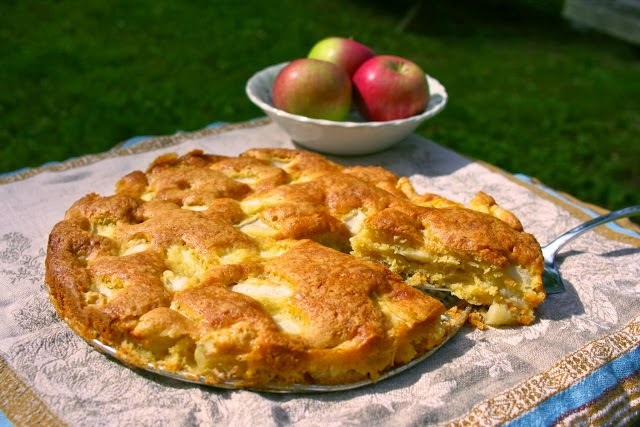 The Apple Cake is also one of my favorite recipes, even though it didn’t make my list! And I think everyone picked The Pumpkin Stuffed with Everything Good! That has become a regular on my Thanksgiving table! Happy Friday, Diane! I am actually surprised about the pumpkin dish. I didn't realize it was so popular. I guess everyone is looking for a non pie pumpkin recipe. I forgot about the Chicken Diable. The was so easy and turned out so delicious. I like your choices, each and everyone looks fabulous. You have to make Chicken Diable sometime soon. It is an easy and really delicious dish. I picked the pumpkin for my list as well and sure wish I had remembered the Blueberry Roulade. That was absolutely delicious. This is what keeps happening to me everytime I read another list. I keep wanting to add more. So many recipes, I have discovered a few that I need to make also. This was a tough assignment, to narrow it down to just 5. I like your choices. And the side effect of reading everyone's post is wanting to make everything all over again. I didn't pick it, but I did love the chicken diable sauce, a lot. The roulade is one of the handful recipes I missed. Maybe you've inspired me to give it go before the end of our celebratory month. Definitely make the roulade now it's in season. Diane I love your list. I have not made any of those recipes yet so that really helps me out on what to cook next. I look forward to following your blog as I love the way you approach food. Wishing you some down time soon. My kid's schedule has also revved up before the end of school. Sounds like you have a few great recipes still to try. Hope your schedule isn't as crazy as mine. I just got a chance to buy a few pairs of shorts for the summer... help. Great choices! I suspect that apple cake will be on many of our lists. And the chicken chapter was one of the hardest to choose from - so many winners! What a fun list (and what a fun spring you are having!!). So many delicious recipes. The apple cake, of course, was on my list. Your other dishes look great. I can certainly understand about your crazy schedule. So happy you were able to celebrate with us!! I love that your favourite recipe was a baking dish, but you hate baking. Fabulous - Dorie has an amazing way of challenging us. I didn't really think about that...very ironic. We all remember our first recipe. Probably because we are so terrified at how it will come out? Diane, I am late getting to your lots-of-memories post because I was recruited into assisting with graduation events this past week-end. Back into you young Mother's world. My long-time neighbor and friend, Blanca, whose son, Cav, was graduating, seemed to be chairman of most of the graduation events!!! Enter, Me. Besides all the hoopla and activities, on Graduation evening, I was driving around Aspen picking up donated food from all the local restaurants for Project Graduation, where all the graduates gather all night to party and eat and have fun - they are locked it. It works, gets kids off the road, no drinking and keeps them alive. It actually was a fabulous and wonderful week-end of celebration, I picked up food at many of the high-end restaurants where I had never eaten, and was totally beat by Sunday night! So, reading your post was refreshing and I loved your choices. You are the first that I've noted who picked a roulade. That was one of my choices also. I remember making it, knowing it was just not going to "bend" or "roll" and, it did. I was amazed with myself. I also loved that chicken recipe. M-H's apple cake was my choice as a fave also - cannot count how many times I have made that. Just wondering what your Julia's favorite recipe was. She made so many and it would be fun to know her choice. Keep being a good Mother. It goes too quickly. Your schedule sounds like mine. Julia's favorite recipes are: the chocolate eclairs, the brioche, the cheese soufflé, the lemon spinach, and the Normandy apple cream dish, can't think of the name. The Marie Helene Apple Cake is a delicious one and would be one of my favorites except that Fresh Apple Cake was one of my Mother's signature recipes. Anytime I make another apple cake I feel a tiny bit disloyal to her memory:) I remember well the days of running all over town to fit in children's activities. At the time, I couldn't wait to have those days over; now, I miss them horribly. That's Motherhood in a nutshell I think:) Nice list! I know I will miss the kid's activities and having them around... in a blink of an eye they will be in college. It is just hard to muster up the energy. What a great list. All of these made my short list of recipes, and 2 made my top 5. 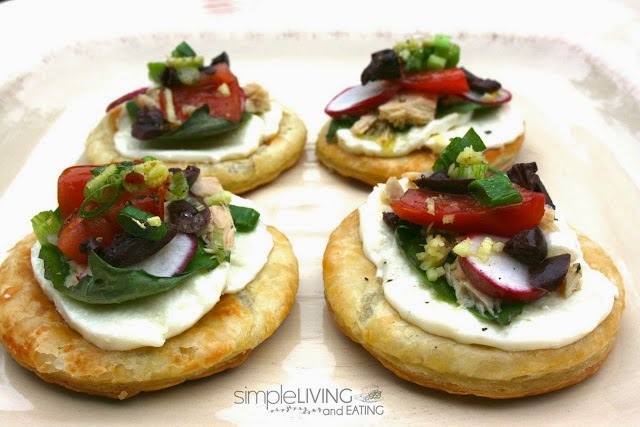 I never thought to make the tuna, mozzarella, and basil pizza with canned tuna. Love the idea! I'm not surprise. I can recall many times when we agreed on recipes. Hope things are winding down for you. Oh my gosh you had me at the apple cake, then every other recipe on this post. I can't wait to try each and every one of them. Thank you for sharing with the Clever Chicks Blog Hop! I hope you’ll join us again next week! An amazing collection. I've had apples on my mind, so your cake is calling out to me. 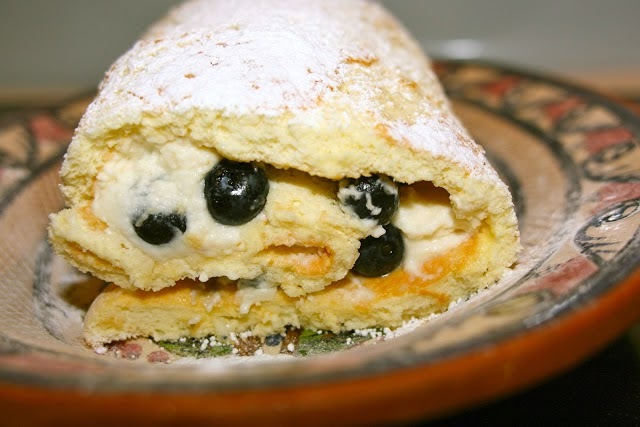 The Blueberry Mascarpone Roulade looks fabulous! I hope you get a chance to try the apple cake. It is pure heaven. So many good recipes from French Fridays. I especially want to try the pizza and apple ones still.